Kim Atkins, vice president and COO of the U.S. Grains Council talks about international grain exports. 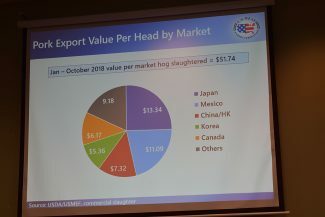 Pork export value per head by market. U.S. beef and variety meat export value. In the past 50 years, meat consumption has increased in countries like South Korea ten-fold. In 1970, residents there consumed slightly more than 11 pounds of meat proteins a year, but today they are well beyond 100 pounds. "Their economy has grown to where they can afford to pay for product and it's available," according to John Hinners, vice president of industry relations for the U.S. Meat Export Federation. 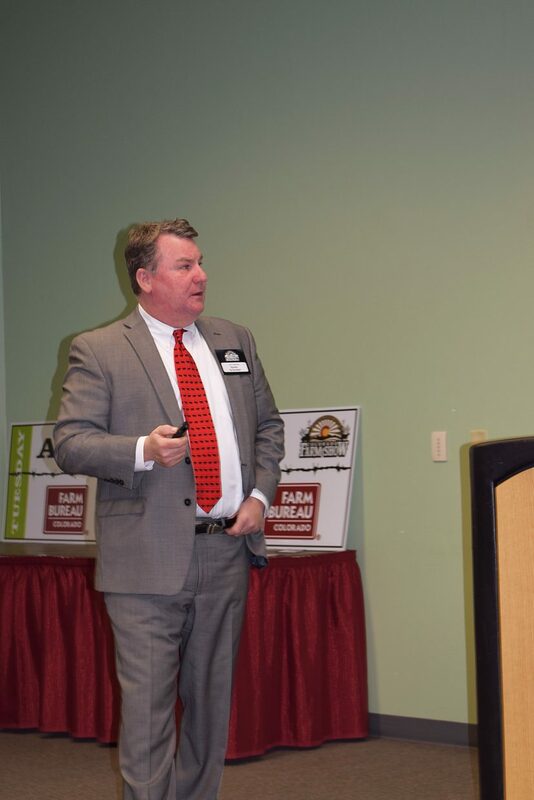 Hinners spoke about export opportunities for the U.S. during an Ag Spotlight presentation at the Colorado Farm Show that was recently held in Greeley. Emerging markets like South Korea are important to U.S. agriculture because production in this country exceeds what it can consume. "According to CattleFax data, each of us would need to consume another 40 pounds of red meat each year just to keep up with our production," Hinners said. Exports are also positive for U.S. grain producers. "Eleven percent of the value of a bushel of grain can be attributed to exports," Hinners said. In fact, the National Corn Growers Association is promoting the value of grain exported through beef and pork through a new video, which explains that the value of meat exports adds 39 cents a bushel to corn. Other countries are also seeking out U.S. meat and grains. "We have a tremendous opportunity for pork in China right now. They are a big pork eating country," Hinners said. "But, our underlying success is in our ability to export variety meats to other countries that are willing to pay more for them than U.S. consumers." In fact, more than 90 percent of pork tongue, heart, liver, kidney, stomach, bladder and uterus are currently exported to other countries as variety meats. Most of this product is shipped to countries in northern Asia and Mexico. 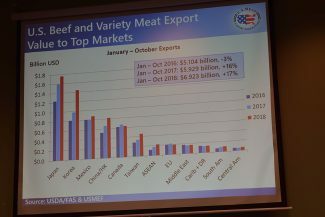 Beef exports also experienced another record year in 2018, accounting for 11.1 percent of production, and 13.5 percent, when variety meat exports were added. The figures were up from 10.2 percent, and 12.8 percent in 2017. From January to October 2018, the export value of a single beef carcass averaged $320.50 a head, which was up 15 percent from 2017. 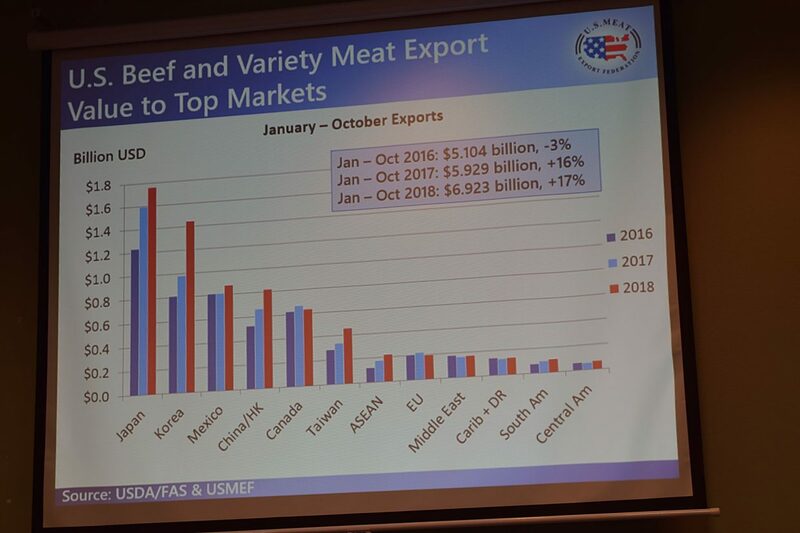 U.S. exports for beef and variety meats were $6.923 billion from January through October of 2018, which was up 17 percent from the same period in 2017. Hinners said they have done a lot of education in places like South Korea, which has developed into a big market for U.S. beef. However, Hinners is worried that the U.S. will alienate customers during trade talks. "If we continue to alienate our customers, they will look south to countries like Brazil and Mexico. It is concerning to me," he said. Kim Atkins, who is vice president and COO for the U.S. Grains Council in Washington, D.C., also sees the potential for tremendous growth outside U.S. borders. 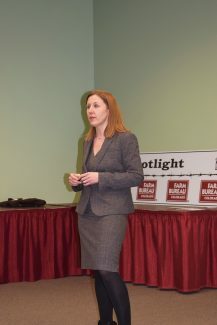 Atkins spoke about international grain exports during her presentation. Countries like Europe, Latin America, Asia, Africa and the Middle East have growing economies and will be looking for better products to feed their populations. The mission of the U.S. Grains Council is to develop markets, enable trade, and improve lives, Atkins said. "Our theme is when trade works, the world wins." Atkins says Mexico, Japan, South Korea, Colombia and Peru are the top U.S. markets for grain exports. "In four out of five of those countries, we have strong free trade agreements in place, which helps. Good trade policies and a strong marketing program are also important. It also helps that the U.S. has been a top corn producer throughout history." Like Hinners, Atkins says the U.S. has to be diligent staying on top of its game to retain these valuable export markets. "Our top competitors for corn are Brazil, Argentina, and the Ukraine. When the U.S. went through a drought back in 2012, our trade partners had to look to other areas for supply. Once you lose those customers, it is hard to get them back," she said. In addition to corn, the U.S. is also exporting more ethanol to countries where more people can afford to purchase cars like Brazil, Canada, India, the European Union and China. However, the U.S. has a 70 percent tariff for ethanol going into China, so it is not a market right now, Atkins said. More than 65 other markets also have biofuels policies in place. In the last year, 11 of them have announced significant expansion to their policies, Atkins said. "U.S.-based corn ethanol will be allowed in Japan this year." Dry distillers grains are being shipped to countries like Mexico, Turkey, South Korea, Vietnam and Thailand. A lot of dry distillers grains are used in swine and poultry diets, Atkins said. "There is an increasing feed demand in South and Southeast Asia." "Failing to move forward on trade means falling behind, and the U.S. is significantly behind in the number of free trade agreements it has," Atkins said. "We have only had 20 trade agreements in place since World War II. We're anxious for the administration to start playing offense and putting some free trade agreements in place. A lot of the successes we've had are from our in-country presence. That in-country presence allows us to be a facilitator of dialogue between the shipper, receiver, and sometimes the government, as well."